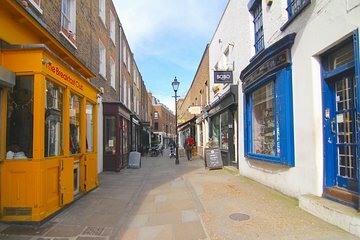 Get to know London’s Islington district on this private tour with an in-the-know local guide who introduces you to the charming area’s shops, eateries, street features and other sights. Learn about up-and-coming hotspots featured in London’s magazines, and feel free to let the guide know what you’re interested in so the tour can be tailored to your preferences. Before meeting your private guide, start your tour on your own at one of Islington’s popular cafes for breakfast (own expense; perhaps enjoy a stack of pancakes and bacon). Your guide will then meet you at the cafe to tell about your private tour of Islington. Listen to the wealth of information your guide provides about the district in order to customize the tour to your interests, and then head out along a cobblestone back alley, walking past coffee shops on your way to a pretty canal. Stop for a drink at a pub on the canal where you can enjoy an ale, craft beer or wine (own expense), and continue your tour along residential roads to find cute courtyards and shops like handmade furniture boutiques. Take a break for lunch with a recommendation from your guide (own expense), and then visit London’s only gallery dedicated to contemporary Italian art, including pieces by Giacomo Balla. For your last stop, choose between a live concert hall or one of Islington’s rock ‘n’ roll venues.